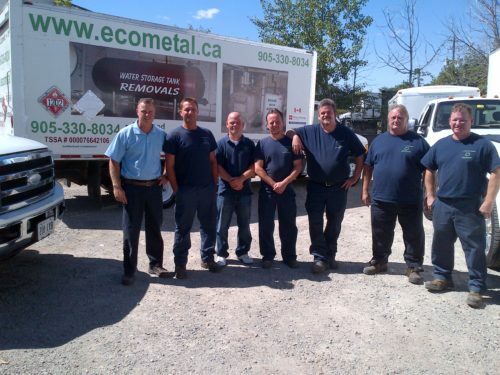 Business Name: Eco Metal Recycling Inc.
Short Business Description: Eco Metal Recycling specializes in Oil Tank removal and pump-outs, UST or Water Tank removal, Boiler and Asbestos removal – serving Ontario clients. Eco Metal Recycling has been in business for over 30 years! You may have not heard the name or seen the image before, all of that is new… however… we are not. We have been removing Residential Heating Oil Tanks, performing other tank removals and Boiler removals since 1979. We also now have been very busy with our heavy dismantling division, Boilers, Generators, Factory equipment, etc. Eco Metal Recycling Inc. was initially established to assist the HVAC Industry and the public sector. We felt it was time to start doing our part by making sure all jobs were done in a ECO Friendly manner… regardless of the size or if the job was Residential, Commercial or Industrial. Not only do we work with industries… we also work with homeowners, real estate agents, environmental cleanup firms or anyone else who may have a need for our specialized services. At Eco Metal Recycling we take great measures to ensure the environment always comes first! You may have questioned how a company that specializes in the removal of oil tanks and boiler removal could accomplish this? – By following a very strict code of environmental rules and regulations in order to guarantee every client and job are properly handled with the utmost care and respect for both. Website Address: Eco Metal Recycling Inc. Listing Title: Eco Metal Recycling Inc.